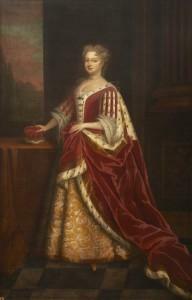 Queen Caroline is one of the larger portraits in the Smith collections. With paintings of her husband, King George 11 and his father, King George 1, she has been in Stirling since 1720, when she was commissioned for the Tolbooth. She is represented with the regalia and symbols of the Princess of Wales. The three paintings were probably obtained for Stirling to show the loyalty of the town to the Hanoverian line in the wake of the Jacobite Risings of 1708 and 1715. Stirling was notorious for its Jacobite loyalties. The original paintings, in various collections in England, are by Sir Godfrey Kneller, but this is a copy made by a lesser artist, to satisfy the market for royal images. George 11 and Caroline married in 1706 and had eight children. They moved to England in 1714, when George became Prince of Wales. Their third son, William Augustus, Duke of Cumberland became known as ‘Sweet William’ to his supporters, but is better known as ‘Butcher Cumberland’ after his defeat of Prince Charles Edward Stuart at the Battle of Culloden, 16 April 1746. The paintings hung together in the court room of the Tolbooth until the early twentieth century.